The most common interference of the flow of information throughout the nervous system is a caused by a pinched nerve, known as a “subluxation.” A subluxation occurs when a vertebra slips off the elastic disc that cushions it against the vertebra below. This misaligned vertebra then presses down on the nerves, causing a “pinched” nerve, and the nervous system is consequently no longer able to transmit as efficiently as before the messages from the brain to the rest of the body, and this results is loss of function, especially impairment of the immune system. Subluxations, therefore, can lower the body’s resistance to infection, disease and disability. Subluxations are caused by slips, falls, and accidents. They also may be caused by gradual wear and tear brought on by such things as long hours of driving, poor posture, awkward sitting positions, unsafe lifting maneuvers, birthing traumas, stress, sudden twisting actions and repetitive motions. 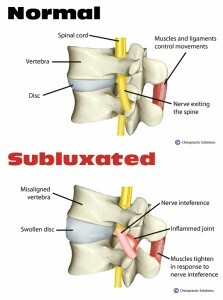 Pain is only one of the symptions of subluxations. Other symptoms of nerve interference are organ dysfunction, respiratory, and digestive problems. If the problems that are caused by nerve interference are treated with medication only temporary relief, if any will be experienced. One of the more obvious signs of a pinched nerve is decreased mobility and range of motion. Less obvious immediately is the impairment of nerves that are vital in the healing injured tissue, and in the functioning of various organs. Subluxations often go undetected for years because they don’t cause pain in the early stages, and the failure to correct this unnoticed problem often results in serious and permanent damage to organs or to the spine itself. Such spinal damage may include the development of bone spurs, arthritis, spinal fusion and finally vertebral degeneration.